International Journal of Environment and Geoinformatics (IJEGEO) is a peer reviewed, international, journal, established in 2014. 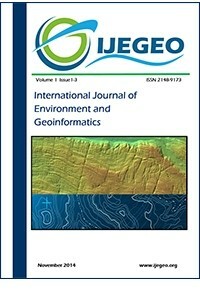 IJEGEO aims to promote the theory and practice from all areas related to geoinformatics and environmental sciences. IJEGEO is an interdisciplinary journal that publishes from diverse fields and disciplines. Earth and Environmental Sciences, Ecology, Pollution, Integrated Coastal Zone Management, Remote Sensing, Photogrammetry, GIS, GPS, LIDAR and Laser Scanning, Spatial Data Infrastructure, Oceanography, Meteorology, Climate Change, Archaeology, Geomorphology, Geology and Geophysics, DSS, Biological Conservation, Hydrology and Water Resources.